Today is the birthday of zanthinegirl, fangirl extraordinaire, hero to infirm babies, and my meme twin. (Srsly, we've had eerily similar scores on a number of the things. *raises eyebrow* And you should be ashamed of yourself, Mrs. Fred and George Weasley!) Speaking of shame, here's a little birthday trifle from someone who has none. Please forgive his rudeness, but the sweltering July heat has made doll!Spike downright cranky. *whispers* I'm thinking that it might be someone's nap time. Hey it was someone elses birthday recently too! I miss you. Hope you're well. Hee! Yup, clearly poor little doll-Spike has no shame at all, but I'll forgive him due to excessive cuteness manliness. Thank him for the birthday wishes, and the excellent taste in music! Also? Looking at that picture I'm pretty sure we have the same placemats. Great minds! I even have similar (though not identical! )napkins and tablecloth! 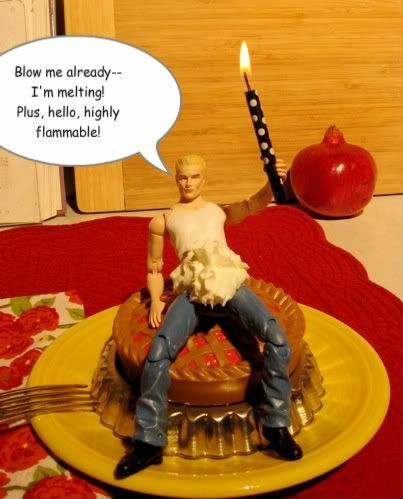 *snicker* The base photo is an outtake from Petzi's birthday, and I've been dying to repurpose it. He looks especially shameless in that one--"yeah, I've got whipped cream all over my crotch. Worship it!" Will you have your cell phone with you? Do I have your number? Do you have mine? Yep, I will, and nope, I'll bet you don't; I hardly ever use the thing! I'll send you my # in a sec here. Could you please send me yours again as well? I thought I had it but can nae find it now.